Treat your family to a picture-postcard Christmas in Abingdon. "A Southern version of It's a Wonderful Life." Historic downtown Abingdon is full of charms during the holidays. Escape to Abingdon for a winter getaway, and take care of your holiday shopping while you take in the twinkling lights and cozy eateries on Main Street. Abingdon is so enticing at Christmas that Southern Living wrote "If Frank Capra had made a Southern version of It’s a Wonderful Life, he might have set it in Abingdon, Virginia, with its tree-lined Main Street, scenic Blue Ridge setting, historic Martha Washington Inn & Spa, and legendary Barter Theatre." 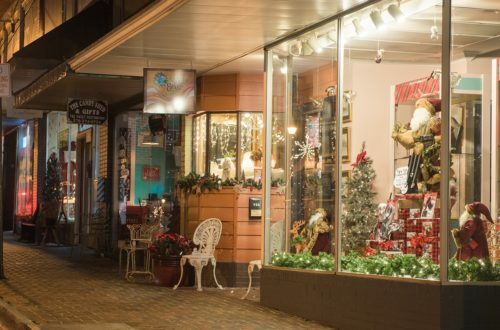 Every weekend, Abingdon’s quaint downtown is transformed in to a Christmas wonderland, with carolers, magical storefront displays, the scent of roasted chestnuts on the air and special events to celebrate the season. There are plenty of opportunities to find the perfect gift, as Abingdon’s merchants stay open late to accommodate shoppers. Abingdon is known for its charming mom-and-pop stores, which offer unique gifts you won't find in the mall. This holiday season, Abingdon's merchants invite families to spend the entire day in Abingdon. Browse the storefront displays downtown. Grab a bite at one of Abingdon’s locally owned restaurants, and enjoy the festive decorations downtown. You might even run in to Santa while in town! The Abingdon Farmers Market will be open each Saturday morning with baked goods, crafts and gifts. Kick off the holiday season with the Abingdon Merchants’ Holiday Open House in mid-November. Abingdon is charming all year long, but the town really shines at Christmas. Each year, Abingdon’s businesses compete for the most over-the-top window display. Extended shopping hours help you get a jump start on your holiday shopping. Skip the Black Friday madness, and head to downtown Abingdon for Small Business Saturday, held the Saturday after Thanksgiving. This national campaign encourages shoppers to support small businesses. Abingdon celebrates Small Business Saturday with free family activities and extended merchant hours. Stroll along the adorable brick sidewalks and enjoy the window displays. The lighting of the Abingdon Christmas Tree, and the Abingdon Christmas parade are beloved family traditions, but this year Abingdon has added even more holiday fun, with activities every weekend (and some weeknights). 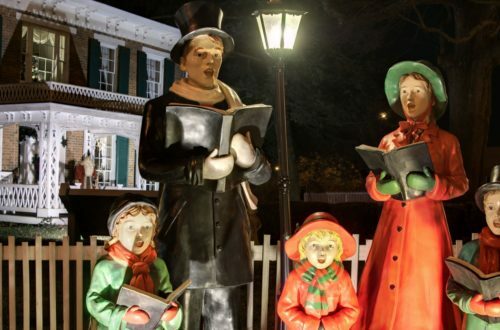 Join in to sing your favorite holiday carols with a free sing-along at Town Park on Main Street. Have breakfast with Santa at Heartwood. Create a Christmas craft with the Elves Workshop at William King Museum of Art. Make the holidays extra special for your little ones this year by posting a letter to the big guy at the North Pole at Santa’s Mailbox, located at 272 W. Main Street in downtown Abingdon. 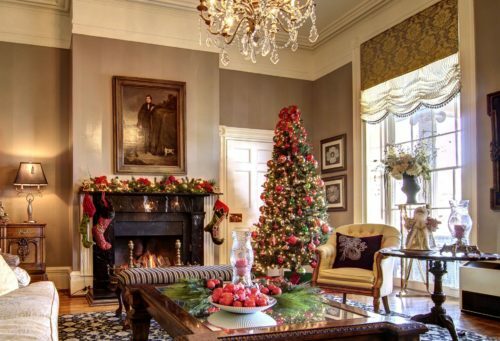 When you walk through the front door of The Martha Washington Inn & Spa, you might actually believe you’ve stepped back in time to Christmas in the 19thCentury. The Martha was built in 1832 as a private residence for General Francis Preston. The original living room is now the main lobby, spectacularly decorated for Christmas. The Martha offers decadent spa packages, and a complimentary glass of port every night, sending you off to bed with visions of sugarplums dancing in your head.